FORT MYERS, Fla. – 11/20/18 Between 25-50 local teens with no immediate family to spend the Thanksgiving holiday will be treated to a family Thanksgiving dinner with all the trimmings thanks to FK Your Diet. Owners Doug Miller and Amy Eldridge opened FK Your Diet in Lee County early this year, the FK stands for Foster Kids. They have pledged 5 percent of FK Your Diet’s revenue to community organizations that serve children and youth in the local child welfare system. Lutheran Services Florida runs a variety of programs in the Southwest Florida. In Lee County LSF provides case management for foster children and youth, while also licensing foster parents, in partnership and as a provider of the Children’s Network of Southwest Florida. Oasis Youth Shelter, another program operated by Lutheran Services Florida has served Lee, Charlotte, Hendry, Collier and Glades counties for nearly 30 providing specialized crisis intervention. Because of the work LSF does to create a place where children are safe, families are strong, and communities are vibrant, a natural partnership was formed with Doug and Amy. One of the most critical needs, especially during the holiday season is creating and making connections that will be special for the youth who cannot go home for the holidays. This year, FK Your Diet along with sponsors The Pewter Mug North and Southwest Ice Machine has agreed to take on this mission by hosting between 25-50 foster youth and shelter teens from area homeless and runaway youth shelters on Thanksgiving Day. Hoping to make the day truly memorable, Doug and Amy have a gift for each of the youth. 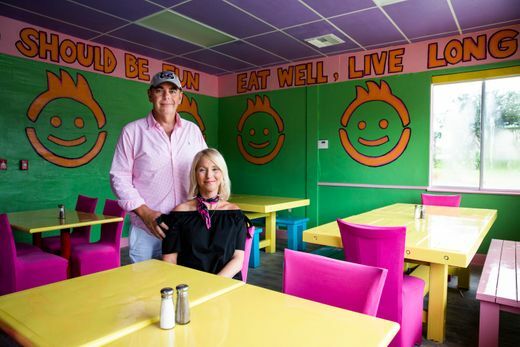 The couple have been in the news since their grand opening and they plan to continue finding innovative ways to make life a little better for Southwest Florida’s foster children and other vulnerable youth living in this community. Click HERE & HERE to read local news articles. Some of the youth will have signed media releases to allow for pictures and interviews.